I just realized how good Oreo cookies are! I haven't had them for many years until just recently when I made those Oreo truffle cake balls and now these heavenly brownies. My pregnant sister-in-law has been requesting desserts to satisfy her sweet tooth cravings during pregnancy so I helped her out by making these the other day especially for her! Of course, we couldn't let her get away without leaving a few behind for us to enjoy! These were seriously good. Moist brownie layer with finely crumbled Oreo cookies mixed with cream cheese and then finished off with a layer of melted chocolate. 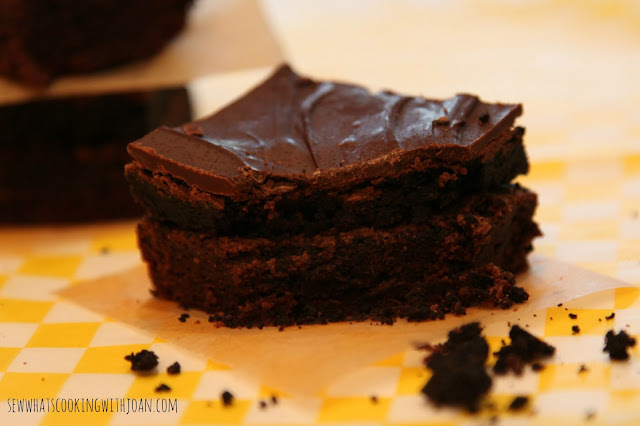 The only part you need to bake is the brownie layer, so these are pretty quick to put together. 1. Cream butter and sugar together. Add eggs and blend well. Add vanilla, salt, cocoa and flour. Pour into a greased 9x13 pan. Bake at 350F for 20-25 minutes. Allow to cool completely. 2. 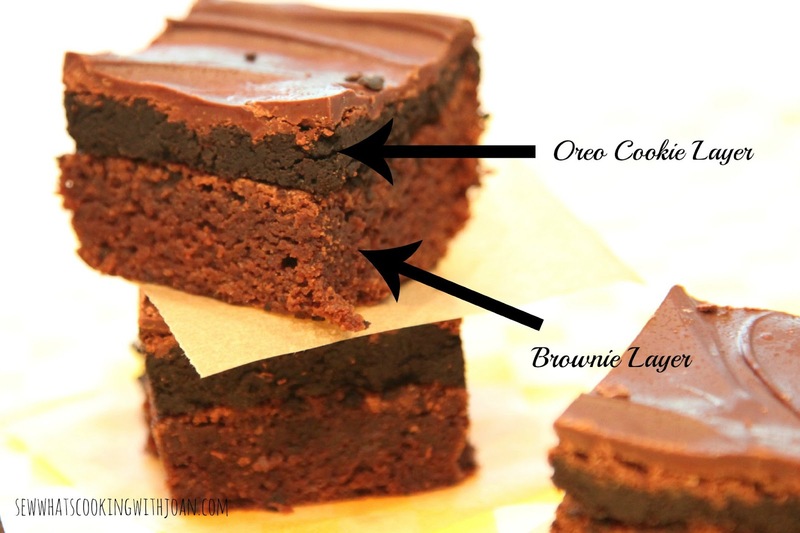 While brownies are cooling, make Oreo truffle layer. Crush Oreos finely in a food processor. You can also place them into a zip lock bag and crush them by hand using a rolling pin. When Oreos are finely crushed, using hands (which I think is faster and I also use this technique for cake balls/pops), mash softened cream cheese and crushed Oreos until well combined. Start with 4oz and keep adding until you reach your desired consistency. When brownies have cooled completely, place layer of Oreo truffle on top. 3. Melt dipping chocolate (I used bittersweet chocolate chips) and pour and spread evenly over the top of the Oreo truffle layer. Cover and put in the fridge until set. You definetely need a tall glass of milk for these! These would freeze well. Just make sure to wrap them individually in plastic wrap before placing in a large ziploc bag. 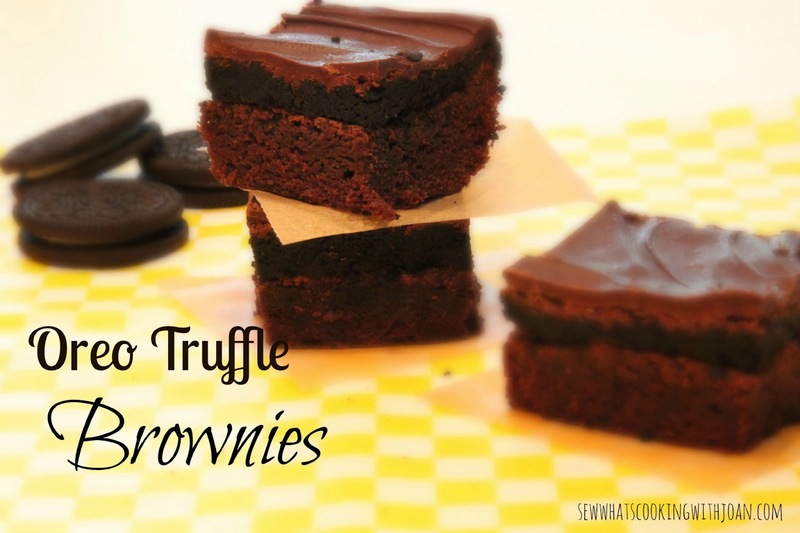 I just love desserts that you can make in advance and pull out of the freezer when company comes. JJ, Laura and I are hosting a baby shower for the expectant mommy next month. We will have a few posts dedicated to that in the coming weeks. The nursery theme Tink has chosen is baby jungle animals. We can't wait to share with you all the decorations we have picked out for the shower! 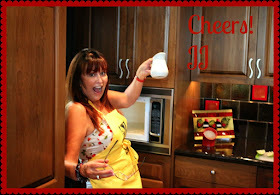 In the meantime, JJ will be back with a post on Wednesday. Oh how I wish I had these to serve my guests coming in from Cabo!! With all the nursery bedding I'm making and sending daily up to Tink, Doggie and baby W I haven't had time to do anything but, dinner's!! However, I did have time to make our two resident pup's some delicious cookies! Hmmm priorities? They will be posted on Wednesday! Great post Amy girl! See you soon!